New Orleans’ premier purveyors of roof raising, jazz infused, funk and hip hop fuelled marching band music, Hot 8 Brass Band can be found at the heart of a current fever for all things brass. 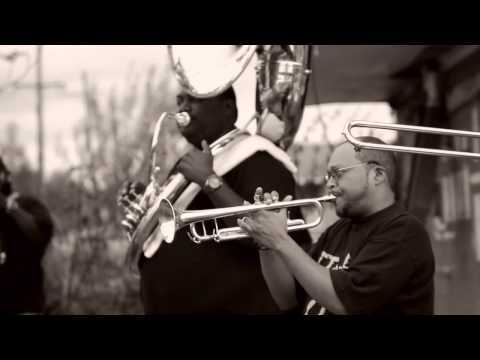 New Orleans’s own Hot 8 Brass Band has epitomized New Orleans street music for two decades. The band plays traditional Second Line parades, hosted each Sunday afternoon by Social Aid and Pleasure Clubs, infusing their performance with the funk and energy that makes New Orleans music loved around the world. The members of the Hot 8 were born and raised in New Orleans and many began playing together in high school. Today, the Hot 8 combines local performances with national and international appearances. With their third LP, ‘Tombstone’ closely following sister album ‘The Life & Times Of…’ (Nov 2012), Hot 8 have gained widespread coverage and support. They have been featured in the HBO series Treme, in Spike Lee’s When the Levees Broke, and on Time-Life Records and Smithsonian Folkways, and regularly tour the US and the World including a Europe and US tour coming up this year.